Screenshot from Mickey Mouse in Black and White Volume 1. (Timecode 00:00:04 of main feature). DVD issued by Walt Disney Home Entertainment, December 2003. DVD © Disney. Film copyright MCMXXIX (1929) DISNEY. 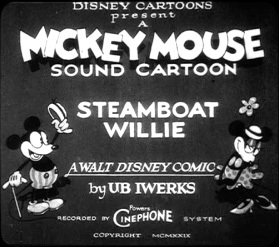 Today, in 1928, Walt Disney took the cartoon world by storm with Steamboat Willie. It was the first cartoon with synchronized sound. Then, again, in 1937 Disney continued with creating the first sound and color animated film, Snow White and the Seven Dwarfs. It’s safe to say he did animated cartoons and he did them well, so well that people continue to come back again and again. Following Walt Disney’s lead, what we do we want to do it well, not for us, but for you. We specialize in home energy audits. You may have heard of it before. It’s a service that can help you live more comfortably, safely, and affordably, all while reducing your carbon footprint. Like cartoons, there are different versions out there of a home energy audit but only some may be of worth. Ours is different. For one, it’s comprehensive. It takes more than just a clipboard to do our audit. Our advisors are certified and equipped with tools to test your entire home’s performance. After we do the audit and the improvements on your home, we come back and run a test just to make sure everything is at its optimal performance. Find a location near you and see us do it well. So well that we know you will want to bring others in to show them just how well we did. And, whatever field you may be in, we offer the same advice to you, whatever you do, do it well. This entry was posted on November 18, 2014 at 3:00 pm and is filed under Comfort, Energy Audits, Green, GreenHomes America, Home, Insulation, Technology. You can follow any responses to this entry through the RSS 2.0 feed. You can leave a response, or trackback from your own site.